The New York Times asks: Do school libraries need books, now that everything’s online? Online debate ensues. This is the third in a series of posts featuring librarians taking an interesting approach to the profession. Previous posts have profiled bike-tripping University of Oregon Social Sciences Librarian Miriam Rigby and Heather Ward, UN Librarian and certified mahout. If you know of someone else you’d like to see interviewed, please let me know in the comments. Karen Nicholson is a fellow Re:Generations blogger, as well as the Teaching and Learning Librarian at McMaster University in Hamilton, Ontario. She’s been a librarian for about nine years, and she’s about to be whisked away to work with the Council of Ontario Universities on undergraduate learning. Students don’t choose to attend the library session, unlike TV viewers who choose to watch the show. Anna suggests trying to engage/make a connection–but acknowledges that it’s true, if students really don’t want to be there, it all breaks down. Confidence & energy are drivers for enthusiasm–we need to own our expertise and know the contribution we make is valuable. Comment: run the classroom, be confident, don’t wait for students to respond to questions, but call on them for thoughts and contributions. Comment: viewers don’t develop a relationship/liking for TV chefs on one viewing, or once a term etc. Important for librarians to get into the classroom and be with users in many situations. Stay in front of faculty and users. Comment: don’t be concerned with being super-serious and covering every. bit. of ground. This presentation is fun and engaging b/c of the show clips. Librarian showed movie clips in a research methods session on film. Comment: idea of going into a presentation wanting to be fun to watch. Know the material, be sure of expertise–then think about being engaging, entertaining, someone users want to watch. What makes people fun to watch? Baby steps, Anna cautions! Anna has used stuffed animals for very flat classes–“catch the monkey” to make students respond/answer questions. Question: how do you evaluate if they’re learning what you’re teaching? 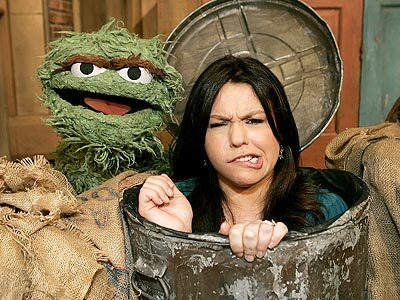 Anna: Food TV analogy, Rachael Ray doesn’t care if you make the 30-minute meal soon, but she wants you to make it, sells you on it. We want to end with where to get more help, like the “Find the Recipe” formula. If they’re interested, and they get stuck, they’ll come back for more help. If they’re not interested, can’t win. Goal is to get them interested in the class. Question: what about flow? TV shows recap constantly b/c of commercial breaks. Every 10 minutes, a shift in gears and a recap of what we’ve done and what happens next. Will minimize sleeping/texting/etc. Anna has students do jumping jacks sometimes. Don’t let yourself lose the flow–you have to own your pacing & structure. Rachael talks about basically nothing while she gets the peanut butter open: enthusiastic paean to p.b. Fills time, makes people like her, get to know her. Next clip: willingness to share stories about own experience. 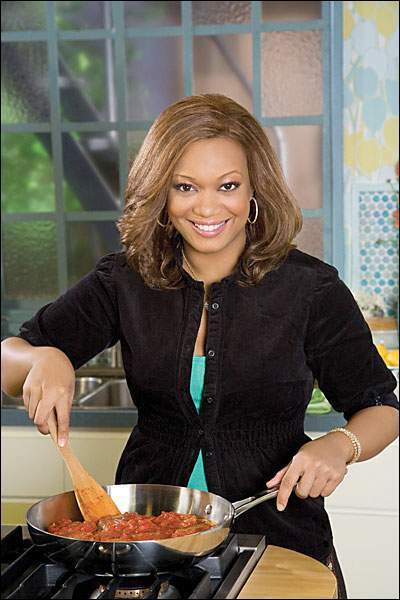 Sunny Anderson also talks about peanut butter, with an anecdote about dating her boyfriend and getting to know food preferences. Her boyfriend likes peanut butter. This results in PBJ pancakes. Anna: use stories as fillers, when walking around classroom in between people who aren’t interacting. If you use a database a lot, tell a story about using it. Tell users what Summit book you have out, while demo-ing Summit. Next clip: Expert knowledge from getting paid to do what you love. Giada de Laurentiis goes nuts for pancetta while she cubes it. Expertise is assumed. Next clip: Ability to explain what you’re doing (and why) while you’re doing it. Bobby Flay talks about how to smoke a turkey. Narrating step by step while doing lots of things at the same time. Sells us on smoked turkey while setting up the bbq. Next clip: Prepare examples ahead of time. 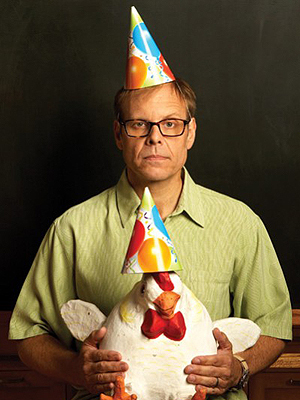 Alton Brown trusses a turkey, using purple tightrope. Includes a demonstration of how to tie a surgeon’s knot. Anna: be open to stopping in the middle of what you’re doing, and demonstrating a particular skill in a more understandable way. Zoom in on the part of the screen you want students to see (Ctrl+ on Firefox, or mouse wheel). Yes, we will have FoodNetwork clips! General applause. Big question: When, how, and from whom do librarians learn public speaking skills? Scenario: library director asks for a demo of a new database to 30 people in 1 hour. Most people (show of hands) would feel pretty intimidated. Public speaking & acting are different skills: public speaking requires us to speak as ourselves. Feelings on it depend on our personalities. Enthusiasm continuum: Ben Stein to Rachael Ray. Most librarians are on the Ben Stein end (introverted.) Regardless of personality, we have to speak publicly. Idea is to get tools to improve them. Some people hate Rachael Ray. Others love her. She’s on half an hour, makes a whole dinner, big personality. About the same amt of time we have in library presentations. Clip of RR making something with peanut butter , showing energy & enthusiasm, passion for her topic. Going nuts for peanut butter. Public Health Image Library (PHIL): beware the diseased body part pictures! Images have lots of metadata that can result in false drops (search on “H1N1” results in promotional shots of families, etc. used in marketing materials.) Good source for public-domain images (with credit) for viruses, germs, scientists, etc. The page that Dan & Tricia put together for the presentation includes all these sites plus handouts on fair use, copyright & permissions, etc. Not everything is on Google Images! Q&A: “standalone manner” prohibition? Means you can’t make a copy of the image and resell/reuse it without any adaptation whatsoever. As soon as you adapt it it’s not standalone anymore. What to do with a large physical file of undated/undocumented images from magazines etc.? Student worker! Develop clear policy around use and reuse, copyright guidelines. How often are images indexed for these image sites? Almost a monthly basis for some, with blog postings for updates. 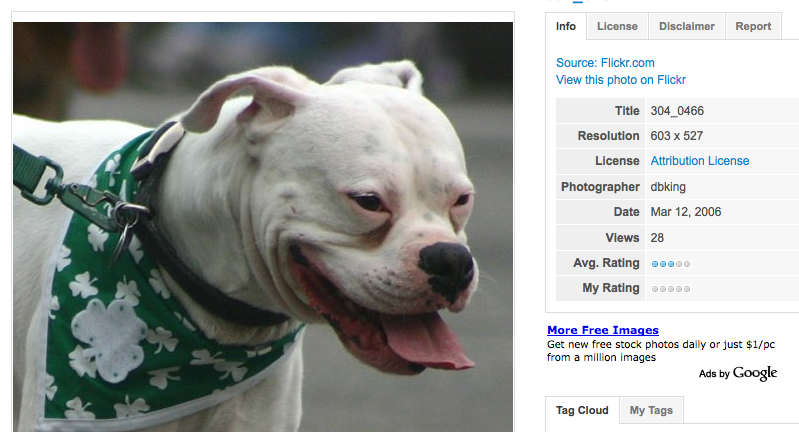 Not instantaneous, so not everything licensed CC in Flickr will show up in Everystockphoto.com, for instance. 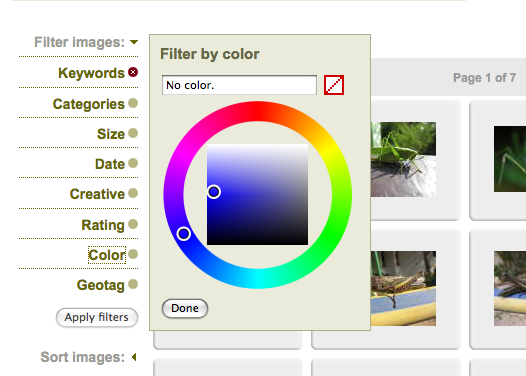 What to tell students who are creating their own Flickr accounts with their own content? Dan advises them to be careful and investigate sharing options, licensing options. Thinks most don’t really do it. Tricia stresses copyright & fair use in design/image resource instruction. Pushes caution and never post anything to Web unless they’re sure it’s licensed and credited. Color printers: how much do you charge, are they worth it? Yes, fifty cents a page. Need good print management software. Particular tools for collecting images/organizing them? What do you recommend to faculty/users? Dan: sometimes, thumb drive/hard drive. Zotero snapshots of web pages can work for Firefox users. Delicious.com. ArtSTOR allows faculty to upload images to their faculty accounts. PNCA has its own internal social networking tool, and many people use that. Came in a bit late, we’re past Flickr Creative Commons and on to MorgueFile. Dan’s searching for images of homeless people, grasshoppers, etc. Showing us the metadata (license summaries, user comments, keyword information) and download options. Search limiters on left hand side of screen for search results. Can limit by color! EveryStockPhoto.com is a federated search of stock photos. 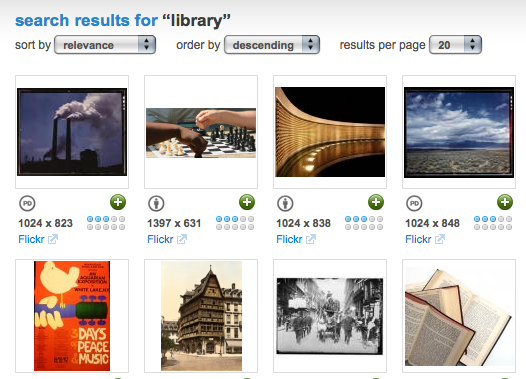 Tricia recommends advanced search: searches across Flickr, Stock Exchange, NASA, etc. Can limit by license i.e. only public domain images or attribution licenses. Can see resolutions and availability right away, can be linked to license information immediately from each image. Lots of information including disclaimer in the tabs on the right of the images. Flickr Commons now… Content often has original metadata from contributing institution, as well as tagging/folksonomy tags from users. Many institutions now contributing, including National Archives. Must have “no known copyright restrictions.” Not necessarily out of copyright. Meaning one of four things: image is in public domain b/c copyright expired or copyright not renewed, institution owning copyright doesn’t care to exercise control, or institution owning copyright allows use. 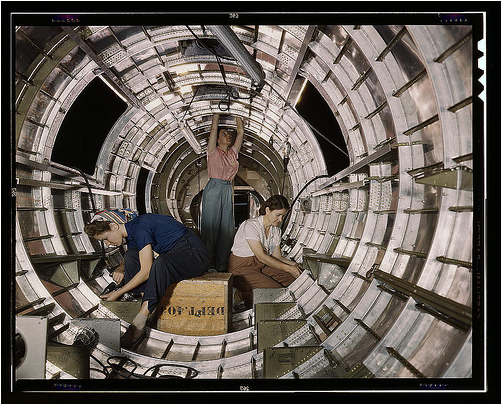 Awesome Commons image from Library of Congress: women workers installing fixtures in B17F bomber. Can see the images in context, i.e. “Migrant Mother,” Lange’s iconic photo, along with the other photos taken that day/in that session. Some images are higher-resolution than others. If you want items in a particular color scheme, put the color name and the word “color” in the search string. I.e. “orange color” yields fewer B&W images than “orange” alone. Database has subject headings and other bibliographic information. Good search for “WPA” yielding many high-quality images. Posting now b/c this is long…more to follow. Dan and Tricia have put together a great resource site for budget / free visual resources online.